"Israel's northern border has become increasingly dangerous in recent weeks with the discovery of Hezbollah’s terror tunnels and Bashar al Assad’s continued efforts to consolidate control of Syria with the assistance of Iranian shock troops," Cruz and Cotton said. "Responding to the threat posed by Iran and its proxies requires ensuring that Israel can defend its territory and its citizens from attacks. To support Israel’s right to self defense, Washington should take the long overdue step of affirming Israeli sovereignty over the Golan Heights." Netanyahu met with John Bolton on Sunday where he publicly asked the U.S. national security advisor for the United States to recognize Israel's sovereignty over the Golan Heights. Israel has maintained control over the contested region for 51 years after taking control in 1967 during the Six Day War. Israel defended itself during the conflict from attacks brought by Syria and other Arab nations in the region. In 1981, Israel annexed the Golan Heights. Since then, the U.S. has refused to recognize the region as sovereign territory of Jewish state. 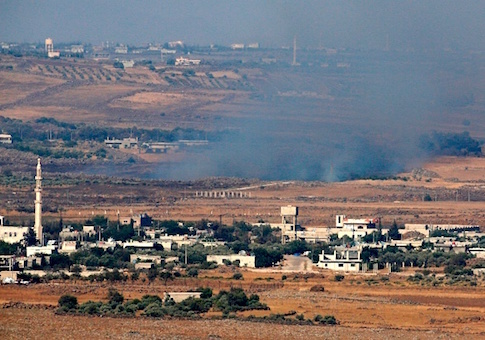 "The Golan Heights is tremendously important for our security," Netanyahu said. "You will be able to understand perfectly why we will never leave the Golan Heights, and why it is important that all countries recognize Israel’s sovereignty over the Golan Heights." Bolton didn't give any indication if the U.S. will officially recognize Israel's sovereignty over the region. Netanyahu said he also discussed the matter with President Donald Trump. Cotton and Cruz introduced a resolution last month that would have the Senate recognize Israel's sovereignty over the Golan Heights. This entry was posted in National Security and tagged Benjamin Netanyahu, Golan Heights, Israel, Ted Cruz, Tom Cotton. Bookmark the permalink.